How many times have you heard abortion providers say, "We are helping women"? Well, the other day, a mother came to our line because of a sign we were carrying. 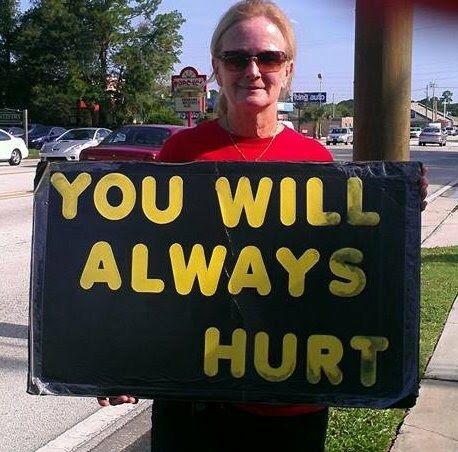 The sign read, "YOU WILL ALWAYS HURT." The mother told her story. She said that in 2006, she went to A Woman's Choice of Jacksonville, the abortion center where we were, to abort her baby. She said that she was the 20th person to have an abortion that day, and while she was waiting, she looked at some printed materials she had been given before she entered the building. When it was her turn to have her abortion, she had changed her mind. BUT, when she told "them" that she didn't want the abortion, "they" said, "Don't worry, honey, you'll be fine," and they gave her the medicine to put her out and aborted her baby. She said that she agrees with our sign!